For years now*, TipTap has been used in classrooms around the world with its unique approach to teaching phonics, spelling, handwriting and typing to students at various levels. The ability to add your own words also helps adults learn new skills. It has been highlighted in a number of books including PCs for Teachers. Music is available to the general public on this site. Click here to go to the download page. Listen to new musical attitudes. Some of it's currently FREE! 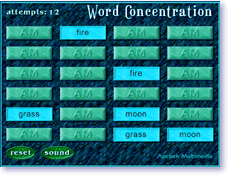 Play our FREE online game, Word Concentration. Test your word and memory skills at the same time. Play for free using Shockwave in your browser. This will be part of the upcoming up for our TipTap4000 Vocabulary Builder. Auto Pics to HTML automatically creates web pages from graphics located in directories on your hard drives, CDs or other media. Many great features. Elegant and sophisticated, yet easy to use. No knowledge of HTML is required. Version 2.0 has been a ZDNet Software Express Editor's Pick!